That’s how far you are away from me. It’s not that near nor that far. 5hrs by Aeroplane is what it takes for me to travel over to be with you. 8 hrs if you include travelling and waiting time at the airport. Living apart on different islands. Two of us in different cities due to our work and family commitments. Working hard to be together and pushing through the daily grinds of life. Doing our best and giving our all. Appreciating each other for who we are. Individuals joined together through the sacrament of marriage. Different but yet the having the same ideals and dreams. Striving towards our common goal a step at a time. Trudging on even though we may be physically or mentally exhausted. Both of us on this life long journey since we entered the institution of marriage 14 years ago. A journey that has seen ups and downs. Tears of joy and sadness. It isn’t easy for me every time we have to part. Dealing with the longing and physical separation only makes my heart ache even more. Oh Golly, Dominique, that is hard, I know. Can you sleep good alone? I sure don’t when Mrs. Jim and I are apart, even for a weekend and the like. Beautiful poem. Being away from your loved one is never easy. One day it will all be worth it! LOVE the POEM, Sis. Being away from your love ones is not easy but only TRUE LOVE survive. Happy Valentines day to you and your family. What gorgeous words. It is hard when we have to do some things just to live but that makes the heart even grow stronger. Came over from Mama Kat writer’s workshop. What a lovely post. Very timely for Valentine’s too. Aw…sniff, sniff. This moved me Dominique. It really did…now I’m feeling all introspective and stuff. This is so sweet. Nothing more to say. How very difficult for you. What a beautiful post. I’m all teary now and hope you’re together soon. This is so sweet. Thank you for sharing. I wish you more love and more time. Thos is a beautiful poem. My husband has been out of town this week and I can relate. Thankfully, he doesn’t travel too much. 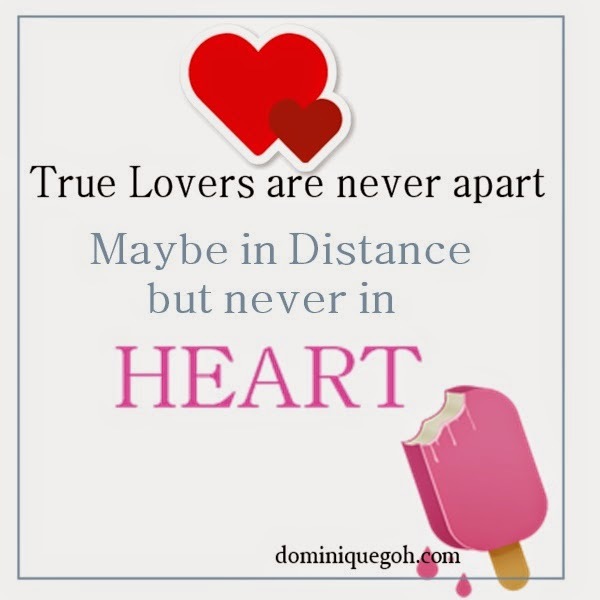 Awww..distance is not a prob if love (and trust) are there. Distance is hard. Holidays make it even more visible. Your poem is really nice. My parents were 14,320 km, or a 24 hour plane ride, away from each other for 5 years of their marriage. They saw each other only once a year during Christmas. I truly believe that the time apart made their marriage stronger and they just celebrated 34 years together last month. Contrary to what people may think, you are actually setting a very good example for your children. I learned from my parents that distance, no matter how far, can never come between them. That was very pretty!! great job and heart felt. Living apart from one you love has to be very difficult. I’ve been fortunate in not having to experience it. I understand this pain. Before we married, my husband and I spent 3 years apart, and we spend each week away from each other – although it’s only an hour and a half…and I could easily be with him at night if I choose. It’s just too much, though. It’s difficult for people to understand how difficult these days are. bless you and your love. This is so bittersweet. It’s not easy so far away from loved ones and I can imagine the longing. I do hope you see each other soon. 🙂 Happy Valentine’s Day! This is a very nice poem. I hope you see him and reunite soon. Bonded in love. You can’t beat that!